Welcome to Shotokan Karate and Self-defense ! 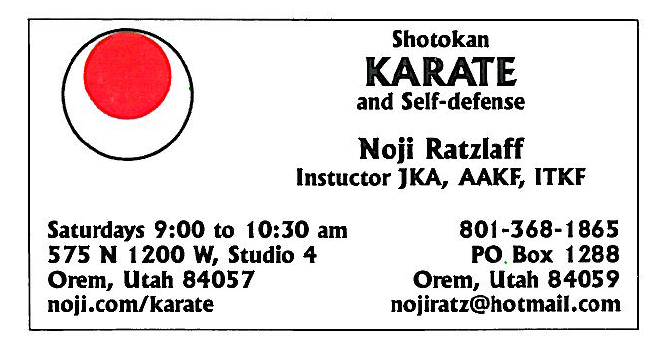 Shotokan Karate and Self-defense is the primary dojo and training center for JKA Shotokan Karate in Utah Valley. We're afiliated with the AAKF (Mountain States Region) and ITKF. Our instructor is Noji Ratzlaff, 2nd Dan. See a copy of Noji's business card. You must be at least eight years old to train in our class. 7-year-old kids can train if they're each accompanied by a parent. You must sign a waiver to participate in our class. You may train with us as long as you like, free of charge, but you won't be permitted to test, compete, or attend special sessions, events, or seminars with us unless you first sign the waiver and pay the registration fee. Once you pay the registration fee, the first month is free. The registration fee, however, is required of everybody who wants to advance. The monthly tuition is waived for parents of paying students. The once-per-month SLC training is optional and is primarily for more advanced students who want to accompany the instructor and train with his instructor. A gi (karate uniform) is not required, but preferred. You may wear sweats or other loose clothing if you don't have a gi. You may also wear other gear, as long as it's not distracting and doesn't hinder the training of others. Footwear isn't permitted unless you have a physical condition that requires it, or we're training on a surface that demands it. You may chew gum during class, but once it comes out, it stays out. Bullying, intentional harm, foul language, and other mean-spirited behaviors are not tolerated. You're not required to raise your hand in order to answer questions or leave the dojo for a bathroom or drink break. It's customary to bow at the door toward the center of the room as you're entering or leaving the dojo. Have fun! No sense in coming if you can't have fun. We have bathrooms, changing rooms, and drinking fountains, but no showers or lockers. Our studio is located around back (west side) of the Center Stage dance building on the bottom floor. You may park in the front or the back of the building, but not in front of No Parking signs.